Forgot your password? Dont have account yet? Register Now! Reminders are excellent means to cope with daily tasks and duties because it helps you remember about important meetings, responsibilities and events. 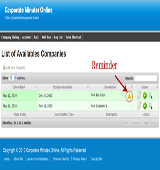 Corporate Minutes Online provides your business with the Calendar and Reminders Feature that will help you keep track of important events and tasks related to your business documents. Corporate Minute Online helps you organize your tasks by reminding you of any upcoming meetings, events and unfinished tasks related to the business documents you have created in our system. Copyright © 2010 - 2019 Corporate Minutes Online. All Rights Reserved. Disclaimer: All information and data contained in this site is a product of consolidated effort of our legal, financial and technical experts but should not be considered as a legal advice. CorporateMinutesOnline.com is not a law firm or a substitute for an attorney or law firm thus Attorney-Client privilege or work product doctrine does not apply between us and our subscribers. 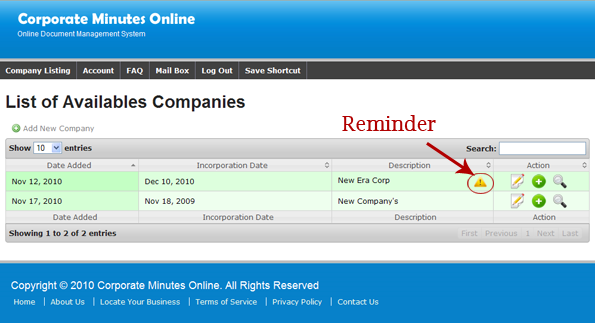 CorporateMinutesOnline.com does not provide legal advice.